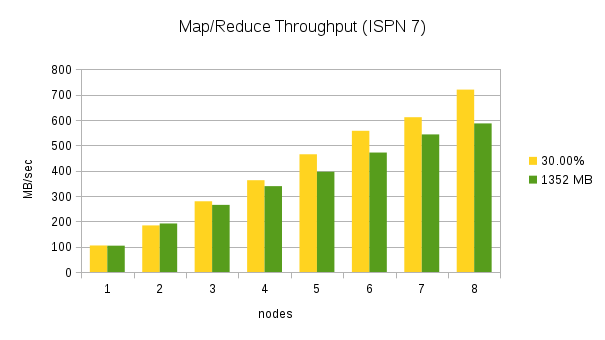 There have been a number of recent Infinispan 7.0 Map/Reduce performance related improvements that we were eager to test in our performance lab and subsequently share with you. The results are more than promising. In the word count use case, Map/Reduce task execution speed and throughput improvement is between fourfold and sixfold in certain situations that were tested. Random data filled 30% of the Java heap, and 100 random words were used to create the 8 kilobyte cache values. The cache keys were generated using key affinity, so that the generated data would be distributed evenly in the cache. These values were chosen, so that a comparison to Infinispan 6 could be made. Infinispan 7 can handle a final result map with a much larger set of keys than is possible in Infinispan 6. The actual amount of heap size that is used for data will be larger due to backup copies, since the cluster is running in distributed mode. The MapReduceTask executes a word count against the cache values using mapper, reducer, combiner, and collator implementations. The collator returns the 10 most frequently occurring words in the cache data. The task used a distributed reduce phase and a shared intermediate cache. The MapReduceTask is executed 10 times against the data in the cache and the values are reported as an average of these durations. 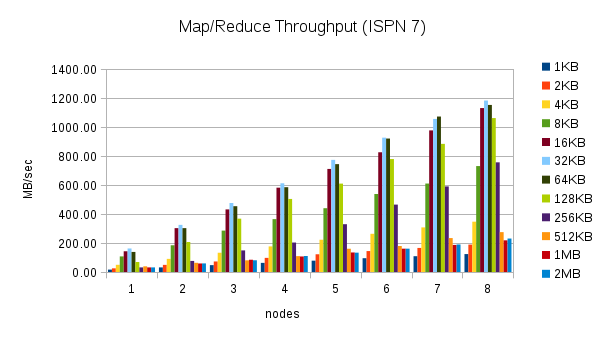 These charts clearly show the increase in throughput that were made in Infinispan 7. The throughput also seems to scale in an almost linear fashion for this word count scenario. With one node, Infinispan 7 processes the 30% of heap data in about 100 MB/sec, two nodes process almost 200 MB/sec, and 8 nodes process over 700 MB/sec. 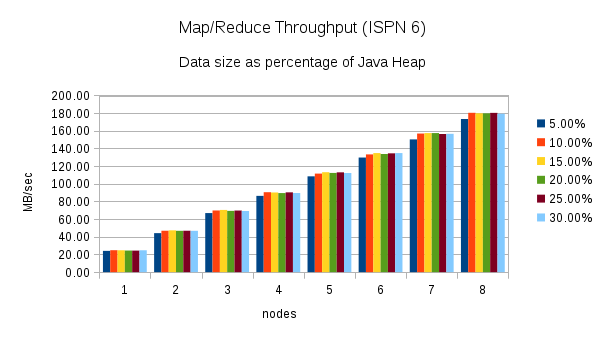 Once again, these charts show an increase in throughput when performing the same word count task using Infinispan 7. 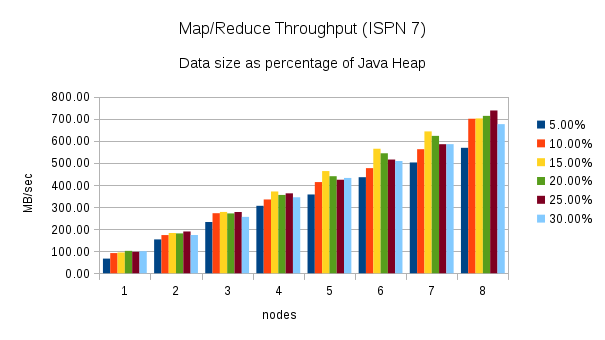 The chart for Infinispan 7 shows more fluctuation in the throughput across the different percentages of heap size. 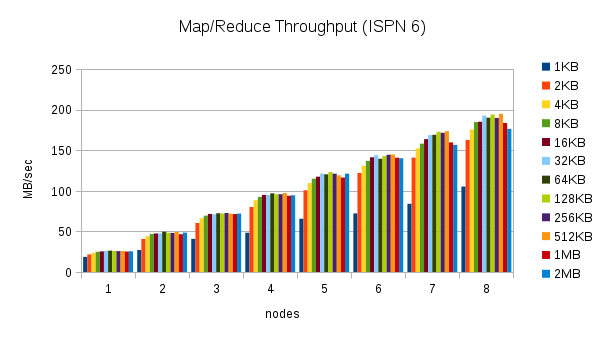 The throughput plotted in the Infinispan 6 chart is more consistent. These results are more interesting. 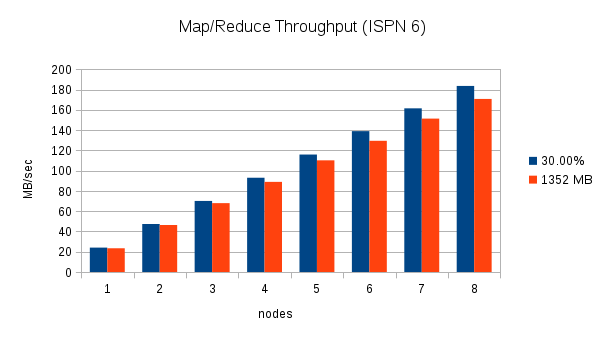 The throughput in Infinispan 7 is higher for certain cache size values, but closer to Infinispan 6 or even slower for other cache size values. The throughput peaks for 32KB cache values, but can be much lower for larger and smaller values. Smaller values require more overhead, but for larger values this behavior is not expected. This result needs to be investigated more closely. The Map/Reduce algorithm should be self-tuning. The maxCollectorSize parameter controls the number of values that the collector holds in memory, and it is not trivial to determine the optimal value for a given scenario. The value is based on the size of the values in the cache and the size of the intermediate results. A user is likely to know the size of the cache values, but currently Infinispan does not report statistics about the intermediate results to the user. The Map/Reduce algorithm should analyze the environment at runtime and adjust the size of the collector dynamically. The fact that the throughput results vary with different value sizes needs to be investigated more closely. This could be due to the fact that the maxCollectorSize value used for these tests is not ideal for all value sizes, but there might be other causes for this behaviour. What hardware was used for performance tests?